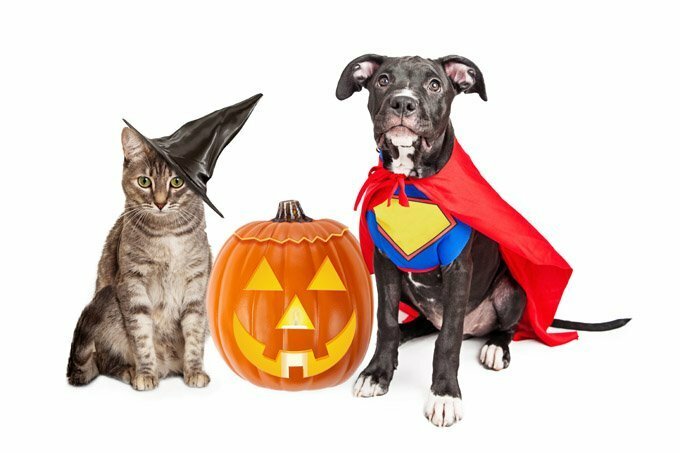 Halloween just isn’t Halloween without trick-or-treaters, bags full of candy, and glowing jack-o’-lanterns, but to your pet these holiday essentials can be downright frightful — even fatal. Therefore, it’s our duty as pet parents to keep our fur babies safe on this holiday. The following tips can help you protect your animal family during this holiday, which is one of the most dangerous nights of the year for pets. Spread the word and educate other pet parents! By taking a few precautions, you can ensure a happy Halloween for everyone in the family, pets included. Chocolate is hazardous to dogs and cats, so be sure to keep the candy bowl out of reach. Dogs may consume a large quantity of chocolate since it’s all sitting in one easily accessible bowl. Cats are less likely to eat chocolate but it’s just as toxic for them as well if they do. Cat’s may want to play with candy since it’s often in shiny wrappers and these shiny candy wrappers and foils can be also be hazardous if swallowed, as intestinal blockage may occur. If you discover your dog or cat has devoured the candy bowl contents, call your veterinarian or the ASPCA Animal Poison Control Center (1-888-426-4435). Keep pets safely inside, rather than out in the yard or roaming freely. Noise and commotion from trick-or-treaters might spook your cat, and pranksters may release your dog from the yard. This rule is especially important for black cats, as it is believed that they are often specifically targeted for torment or abuse on and around Halloween. The constant ringing of the doorbell may overly excite or frighten your dog or cat. The frequent opening of the door provides both cats and fast moving dogs with the opportunity to escape. Keep your pets contained in an area of the home where they can’t easily make a break for the door. This also keeps your pet safely away from trick-or-treaters, who he may not react kindly to out of fear. Your pets should always be wearing ID tags but if they are not, make sure they have their ID tags on them this night especially, just in case. Lit pumpkins and wagging tails do not go hand in hand. Keep pumpkins out of reach to prevent burns and fires (not to mention smashed pumpkins). Pumpkin is a great way to naturally cure stomach upset. However, if consumed in large quantities, pumpkins can cause stomach issues and intestinal blockage. Too much of a good thing can be bad. If you dress up your pet this year, make sure they are comfortable in their costume. It may look cute, but remember that your pet is a living animal, not a dress-up doll. Any restriction of movement or breathing is bad news. Check to make sure there are no loose parts that could get caught and strangle him, and that there is nothing on the costume he can try to eat. Don’t leave your dog or cat in a costume unsupervised. Dress them up, get your pics, and take the costume off as soon as you can. That way, you have the cute pics you want, and your animal can get back to being an animal. Don’t put decorations out where your dog or cat can reach them. Decorations are great but are not made with pet safety in mind. They have pieces that will break off if handled roughly or chewed on that can harm your pets’ internal organs. Every pet owner knows their pets and if you have a mischievous cat or pup, you really need to keep these decorations out of reach. They may get bored while you are at work and decide to play with these fun new items that have appeared all over their home. It’s natural that they will want to investigate. A lot of this is common sense but it’s always too brush up every year on the basic rules of safety to make sure everyone is safe.